The WengerOut Brigade are at it again and you won't blame them if you have ever experienced the mildest heartbreak. After watching their side's disgraceful performance which earned them a 5-1 defeat in the hands of the mighty Bayern Munich, several Arsenal supporters have taken to Twitter to demand the sack or resignation of Arsene Wenger. 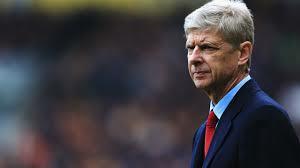 It has been the same old disheartening story for many years and it now seems the answer to the club's progress lies in another manager, not Wenger. Check out a few of the reactions from the club's loyal supporters who took to Twitter to lash out at the Frenchman after the game. Got to Say I'm not shocked at all. Fully expected us to be out of it by the first leg. Wenger out and Ozil with him. It's time for a change @Arsenal. Please @Arsenal just announce that Wenger is calling it quits at the end of the season if not before. This is humiliating again.